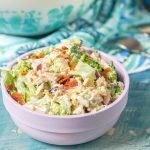 This bacon ranch chicken & broccoli salad is a scrumptious low carb salad that is perfect for a hot summer day or to take to a picnic. Loaded with chicken, bacon, ranch, cheese and the brightness of chopped broccoli to make a filling low carb lunch with 3.7g net carbs per serving. Add the broccoli to a microwave safe bowl. Cook for 1 -2 minutes. Then quickly add to a bowl of ice water to blanch it. Dry off the broccoli and add to a large bowl. Add the rest of the ingredients and mix well. Refrigerate for about an hour before eating.